Traditional removable dentures often slip out of place while eating, speaking, or smiling, causing discomfort and embarrassment. Dr. Jose Valenzuela Jr. provides snap-in dentures, also known as snap-on dentures, an alternative that combines the convenience of a removable denture with the stability of dental implants. So why should you consider snap-in dentures? Implants are embedded in the jawbone to provide unrivaled support for dentures. Snap-in dentures are removable, making them easy to keep clean. Snap-in dentures can use as little as two implants, saving you money. What Do Snap-in Dentures Look Like? At Cosmetic & Implant Dentistry Center, we use advanced dental technology to provide all stages of the snap-in denture treatment. We can take detailed scans of your jaw and sinuses using our computed tomography (CT) scanner. Then, we can create a surgical guide on our in-office 3-D printer. When designing your final restoration, we can use intraoral scans and our smile design software to craft a customized denture that suits your unique needs and preferences. Do I even qualify for a snap-in denture? Most patients with extensive tooth loss who qualify for dental implants can receive a snap-in denture. We can convert your traditional denture to snap onto implants, saving you money. If you have experienced tissue loss, you may still qualify for snap-in dentures. If you have a narrow jawbone, we can use smaller implants to provide stability. Dr. Valenzuela discusses candidacy requirements for dental implants, as well as the treatment process. The treatment timeline for snap-in dentures will vary depending on a range of factors, including your current oral health. Generally, the entire restoration process takes about six months. Planning: You will attend a consultation appointment with Dr. Valenzuela. We will take scans and make a personalized treatment plan. Preparatory procedures: Dr. Valenzuela will perform any treatments necessary to restore your oral health before implant placement. These may include bone grafts, extractions, or treatment for gum disease. 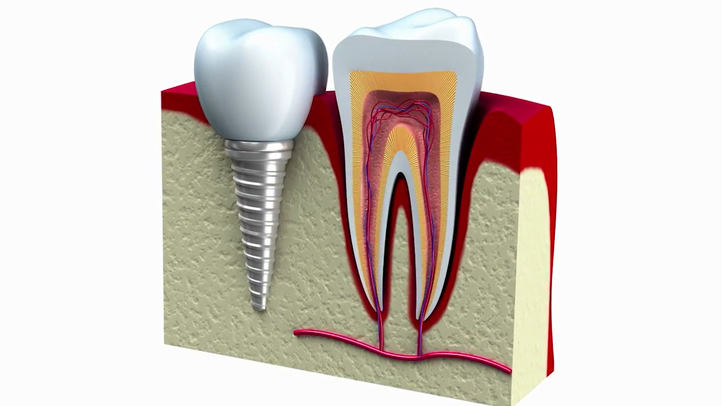 Implant placement: Dr. Valenzuela will embed two or more dental implants into your jawbone. Typically, the posts are placed at the front of the mouth where there is more bone. Healing time: We will monitor your healing for three to six months until your implants have fused with your jawbone. We may attach a temporary restoration during this time. Final restoration: We can design a customized denture or adapt your existing denture to fit your implants. Then, Dr. Valenzuela can attach your restoration. We will also show you how to remove, clean, and reattach your snap-in denture. Will my final result look natural? Before - This patient's smile was compromised by decay and missing teeth. After - We restored her smile using a natural-looking zirconia denture. Can I Really Afford Snap-in Dentures? For many patients, snap-in dentures are an affordable way to achieve a stable full mouth restoration. Since they require fewer implants, this method can save you money when compared to another type of implant-supported denture. In addition, converting your existing denture can reduce your overall treatment cost. While snap-in dentures can use as few as two implants, you may need more posts. If you need preparatory procedures, your final treatment cost may be higher. Some materials cost more than others. We typically use acrylic and porcelain. Sedation can improve your comfort but may increase your overall treatment costs. Advanced treatments, such as PRGF®, can speed healing but raise costs. While any restoration supported by dental implants has a higher upfront cost, they offer a level of stability unmatched by any other tooth replacement option. In addition, implant-supported restorations tend to require fewer replacements and offer improved overall oral health. I am so happy with the work I had done here. I don't like any dental work being done but when it has to be done this place is the place. Very clean and state of the art place.